So at this point, you must think I'm pretty daft to keep reviewing coffee items. Sure. Well, I'm not denying the fact that I'm a fool, but there's a little bit more to it than that, since I'm quite aware that most of you, like us, are sick of coffee-flavored things at Trader Joe's and have already made up your minds about most of these coffee products anyway. But as some of you may know, as of late, Sonia and I have been nomadic. And as we pass by Trader Joe's locations, we just buy up as many hot new items as we can at the time and try to make them last for a few weeks. During our last TJ's run, the vast majority of new products we saw were coffee-flavored. But I must point out at this juncture that there is a light at the end of the tunnel, and I believe (don't quote me on this) that this will be our last coffee item review for a while. So don't touch that dial, coffee-haters. And now that we've gotten that silly disclaimer out of the way, we can go ahead and review these Vietnamese caramels. What makes them Vietnamese, I'm still not quite sure. And there's no uplifting spiel on the side of the tub to enlighten us any further, I'm afraid. I did a little Googling into the matter, as I'm known to do from time to time, and I did find out something about "nuoc mao," which is apparently a nearly-burnt caramel sugar sauce—a cornerstone of Vietnamese cooking. But as far as I can tell, there's nothing nuoc mao-ish about these candies. However, the image on the front of TJ's tub did provide a clue about the Vietnamese inspiration for these candies. Apparently, it's a Vietnamese coffee press, used in making Vietnamese iced coffee, which strikes me as being akin to one of my favorites: Thai iced tea. But anyway, I think Vietnamese iced coffee is what they were going for here. It's a sugary, milky coffee flavor that's well-balanced and works perfectly as an after dinner sweet treat. It leaves a faint coffee aftertaste in the mouth. The texture is very similar to saltwater taffy—not quite as "stretchy," but just as soft and pliable. 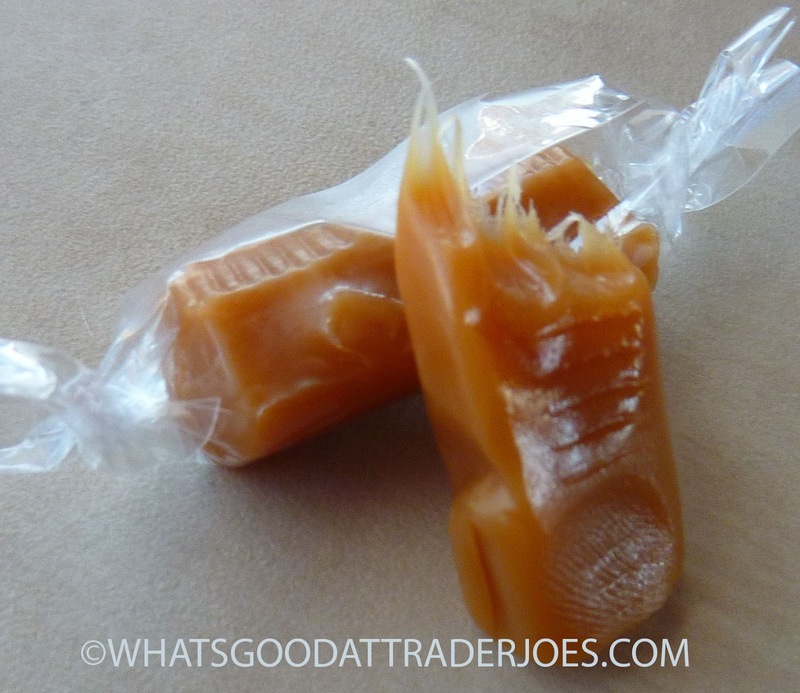 Both these caramels and saltwater taffy contain sugar, water, butter, and salt, so even the flavor is similar. There's no ground coffee here, which is good. Real coffee might have ruined this product's smoothness. 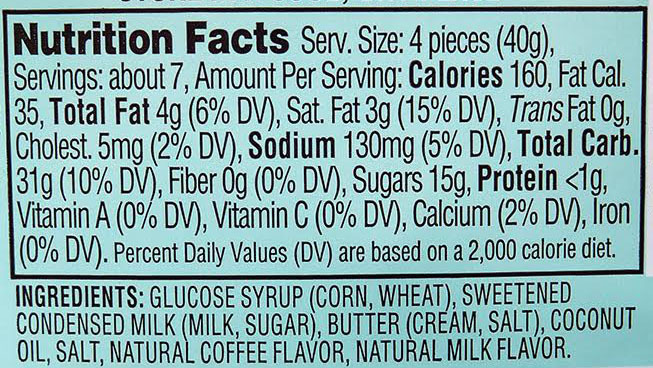 We do have "natural coffee flavor," though, which seems to work just as well. 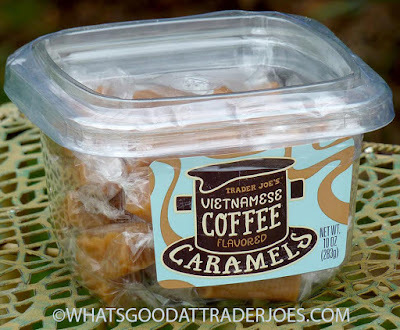 Neither coffee nor caramels are really my thing, but I found this product to be a pleasant surprise. So did Sonia. Three and a half stars from me. Four from her. Vietnamese coffee is strong coffee mixed with sweetened condensed milk. 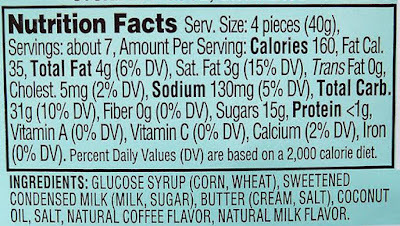 Also they make yogurt from sweetened condensed milk and use it in their iced coffee. I don't hate coffee. I just don't buy coffee tasting food or candy. I drink one cup in the morning and that is enough for me.